Each year on September 26, the mesothelioma community raises awareness for this aggressive and rare cancer on Mesothelioma Awareness Day. This year is the 14th anniversary of the awareness day, which was established in 2004 by the Meso Foundation to bring awareness to the disease and allow community members to come together. Pleural mesothelioma, which occurs in the lungs and accounts for 80% of mesothelioma cases. Peritoneal mesothelioma, affecting the abdominal cavity and accounting for about 20% of mesothelioma cases. Pericardial mesothelioma, which affects the lining of the heart, called the pericardium, and only occurs in 1% of mesothelioma patients. Testicular mesothelioma, an extremely rare variety that affects the lining of the testicles. Less than 100 cases have been reported, and the pathway from asbestos exposure to the testicles is unclear. All types of mesothelioma have a short life expectancy and bleak prognosis. Asbestos has been a known carcinogen for many years, and regulations around the mineral are murky and difficult to navigate. Many people in the United States believed asbestos to have been banned with the Environmental Protection Agency’s (EPA) 1989 Asbestos Ban and Phase-Out Rule, but that particular rule was overturned in 1991. Since 1991, asbestos usage has declined greatly, and many countries around the world have banned it altogether, though the United States is not among them. In fact, the EPA issued a Significant New Use Rule (SNUR) for asbestos production earlier this summer. SNUR allows asbestos back into manufacturing on a case-by-case basis. Advocates for the rule maintain that if used safely in products that are unlikely to break down and come into contact with human airways, asbestos can be a valuable material. Meanwhile, opponents firmly assert that there is no safe level of asbestos exposure or usage. Before SNUR was issued, several consumer products were found to contain asbestos this year. This is not technically illegal, as U.S. rules currently allow asbestos in amounts of 1% or lower in products sold today. However, these instances are alarming from a consumer safety standpoint. Talc is commonly used in cosmetic products like makeup and baby powder and can become contaminated with asbestos. Both talc and asbestos are mined minerals that come into contact with each other in the ground, becoming cross-contaminated. American makeup and accessory brand Claire’s, which is mainly marketed toward children, came under fire earlier this year when a consumer watchdog group released reports that three of Claire’s makeup products contained asbestos. Claire’s refuted these claims, and asbestos buzz died down for a while until earlier this summer when asbestos was found by the same consumer watchdog group in Playskool crayons. The fact that asbestos contamination was found in another product aimed specifically at children was shocking to many parents. Though asbestos can still present significant problems for people living in the United States, technology to treat asbestos-related illnesses like mesothelioma is advancing. The entire healthcare field is venturing into the world of artificial intelligence (AI) to reduce labor costs, increase positive diagnoses, and tailor treatments to patients. Though AI is not yet readily available in town hospitals, research into how AI could be used to detect and treat diseases like cancer is very positive. In some instances, AI machines are just as successful as doctors at diagnosing cancers. Perhaps even more impactful than these strides in diagnostics is the potential for tailored treatments. Timothé Cynober, regulatory scientist at Voisin Consulting Life Sciences, wrote about this potential. The use of AI to crunch the data buried in imaging, genomics, research, family history, and other treatments could solve this problem of information overload. Tasking machines with sifting through data and recommending treatments could cut down on time to diagnosis and treatment, as well as general human labor. Mesothelioma can take 20 to 50 years to develop after asbestos contact, which makes it a difficult disease to diagnose. However, once the cancer takes root, it moves quickly and leaves most patients with a life expectancy of about 1 year. Given access to all known risk factors, AI could identify populations most at risk for mesothelioma and flag them for special review. Access to the potential of large quantities of data could change the game for difficult diseases like mesothelioma. This spring, Food and Drug Administration (FDA) Commissioner Scott Gottlieb gave a speech signaling wider FDA approval of AI development in the healthcare field. How the FDA will seek to regulate this new space of technology is unclear. “AI holds enormous promise for the future of medicine, and we’re actively developing a new regulatory framework to promote innovation in this space and support the use of AI-based technologies,” Gottlieb said. 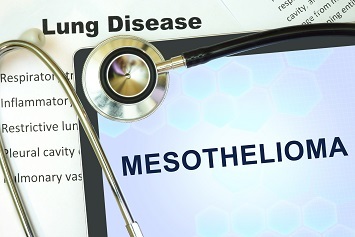 Mesothelioma incidence rates may be low, but the extreme harm this disease can cause is huge. 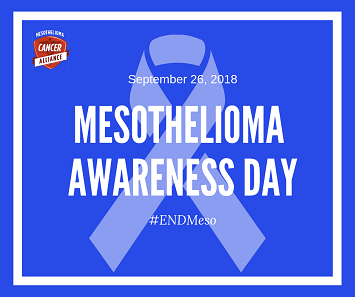 September 26 is a day to educate yourself and others about mesothelioma, and creating dialogue around this disease is important with the new EPA regulations. Lawmakers and the public should be made aware of the impacts of regulatory and purchase decisions. On Mesothelioma Awareness Day, familiarize yourself with stakeholding organizations, learn about this disease, and take a stand against asbestos production.